Performers include: Kyle Howard, Richard Dreyfuss, JoBeth Williams, Danny Comden, Andrew Less, Angela Kinsey, Kat Foster, Ed Begley Jr., Cynthia Stevenson, and Stephanie Hunt. Based on an Israeli comedy, this TV show revolves around different sides of a young couple’s extended family. After all, when you marry someone, you marry their entire family. 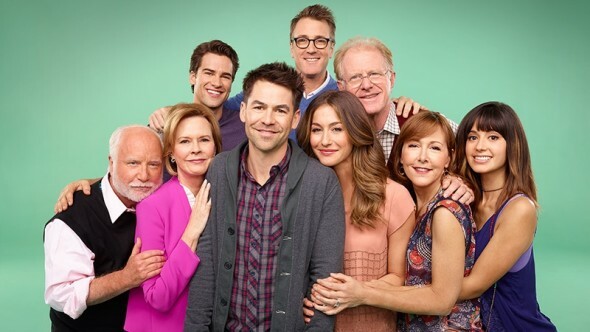 The show follows a married couple in Seattle, Kelli (Kat Foster) and Oliver Weston (Kyle Howard), as they and their two children alternate visits between their respective parents and in-laws. Oliver’s family is more financially stable, but that just makes them more eccentric. His parents are Louis (Richard Dreyfuss) and Rebecca “Ricky” Weston (JoBeth Williams) and Oliver has two brothers — Jason (Danny Comden) and Blake (Andrew Lees). Jason is married to Claire (Angela Kinsey). Meanwhile, Kelli’s family may not have all the money in the world, but they do have each other. Kelli’s parents are Gil (Ed Begley, Jr.) and Jan Durnin (Cynthia Stevenson). Their other daughters are Dani (Stephanie Hunt) and Kelli (Collette Wolfe). To mark their 10-year wedding anniversary, Oliver and Kelli are renewing their vows at the Durnin residence, but Oliver is worried about saying his vows. Gil and Jan are bitter that Louis and Ricky excluded them at their country club during their kids’ wedding. Dani and Blake start dating again. And Claire pesters Shawni about the time she and Jason slept together. First aired: June 9, 2015. What do you think? Do you like the Your Family or Mine TV show? Do you think it should have been cancelled or renewed for a second season? Still waiting on a second season. Maybe Netflix should pick this show up.